The cost of international adoption makes affording adoption can be a huge challenge for many families. Even families who live comfortable lifestyles struggle to think about spending $30,000 or more to bring another child into their home. Often, families will turn to adoption grants when planning to pay for their adoption. Grants can be given by churches, individuals or grant giving organizations. While most families are aware that adoption grants exist, they have questions related to the grants. 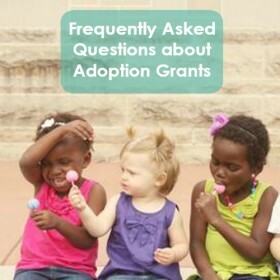 Here are answers to five frequently asked questions about adoption grants. How and where should I start if I am interested in applying for adoption grants? Google is your friend when searching for adoption grants because there are many organizations that provide grants to adopting families. Each will have different requirements and procedures so read the description and requirements of each adoption grant carefully. The application process can be time-intensive, so it is best to identify five to ten grants which most closely fit your particular situation. Follow these five tips for a successful adoption grant when completing the applications. The majority of granting organizations require that families have a completed home study prior to being eligible to apply for an adoption grant. Should you need financial assistance earlier in your adoption process, check out Affording Adoption: Where to Start. Families who have adopted also share that fundraising may help them at the beginning of their adoption journey, and adoption grants can be received once their home study is complete. What are grant giving organizations looking for? Grant giving organizations are looking to ensure their money will go towards families who are truly committed to seeing their adoption process through to the end. To demonstrate your commitment, be sure you can talk about the sacrifices that you have already made in your adoption process. Have you implemented a strict budget and already paid for your home study services? Talk about this in your essay. Knowing you have skin in the game, will prove to the granting agency that you are serious about completing your adoption process. We’re not a faith-based family, can we still apply for grants? Many different types of organizations offer adoption grants and each has their own requirements and application processes. Although, many Christian organizations will require a faith statement, there are many other granting organizations that do not. What if I receive a grant after all of my outstanding expenses have been paid? Most adoption agencies will refund any excess funds to you after you have completed your adoption if allowed by the granting foundation. You will want to work directly with your adoption agency to determine what their policy is. Applying for adoption grants requires hard work, persistence and patience. In many ways, the journey to fund an adoption may prepare a family for the difficulty of waiting for a referral, and parenting a child from a hard place. Remember your end goal – adding a child to your family! And keep your eyes on the reward for all of your efforts which could be a declining balance on your adoption account!